Cleaning and sanitizing bits is the most overlooked, yet most important procedure when using an electric file, according to Medicool's Steve Wallace. 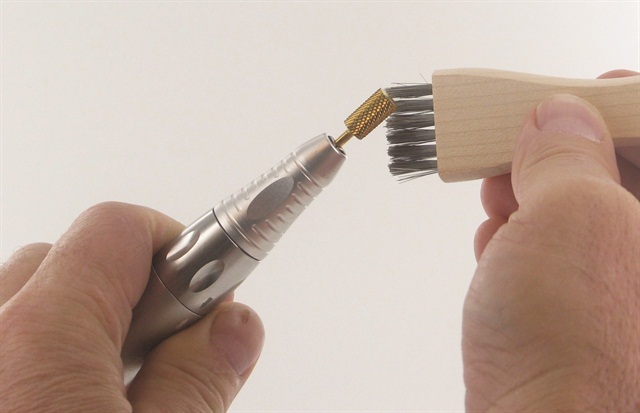 An essential first step is to remove acrylic dust and residue build-up within the grits or flute cuts on your bits. “The bits must be cleaned out periodically to remain sharp. You can use Medicool’s wire brush to do this or soak the bits in a cleaning solution to help dissolve this acrylic material,” says Wallace. Metal bits: After each use, clean your bits to remove debris from the surface either by washing with a brush and soap and water, or by immersing in acetone for five to 10 minutes. Note that acetone is not a disinfectant; it is a solvent used for cleaning. After cleaning, completely immerse your bits in a liquid disinfectant that is approved for use by your state for the time required on the label. Silicone bits: Remove the portion of the bit used on your client by holding the bit vertically on the surface of a course file. With the machine on, press down until you’re past the used portion — similar to sharpening a pencil. Completely immerse the bit in an approved disinfectant. Sanding bands or sleeves: These are single-use, disposable items and cannot be saved or reused. After each use, discard them in a waste receptacle. Store all bits in a clean, dry container until you are ready to use them.